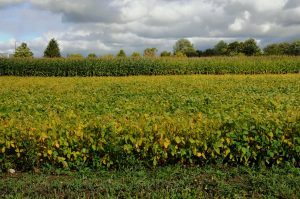 A record high soybean crop and overall corn yield are expected this year, according to the latest Crop Production report from USDA’s National Agricultural Statistics Service. Up 4 percent from 2017, soybean production is forecast at a record 4.59 billion bushels, while corn growers are expected to decrease their production slightly from last year, forecast at 14.6 billion bushels. Average corn yield is forecast to be the highest on record at 178.4 bushels per acre, up 1.8 bushels from last year. Wheat production is forecast at 1.88 billion bushels, up 8 percent from 2017. Growers are expected to produce 1.19 billion bushels of winter wheat this year, down 6 percent from last year.